Line a 17X12 jelly/sheet pan with parchment paper . Set aside. In a mixing bowl add the 2 eggs, 3 egg yolks and 1/2 cup sugar. With the paddle attachment on, beat on medium to high speed around 5 minutes until pale in color and thickened. Add the vanilla extract and beat few more seconds. Sift the flour and the cornstarch over the egg yolks mixture and with a spatula gently fold it in. Fold in the batter bits as well. In a separate grease-free bowl, add the 2 egg whites and 1 tablespoon of sugar. With a whisk, whip until firm peaks form. With the spatula, fold the whipped egg whites into the egg yolks mixture. Pour the cake batter into the prepared pan, spread it evenly and bake for 6-7 minutes until golden brown and, when touched, it springs back. In a clean bowl add the butter. With the whisk attached on to the the mixer whip the butter for 2-3 minutes on medium to high speed. Lower the speed and slowly add the sugar, 1/2 cup at a time. When all the sugar is incorporated increase the speed and whip for 2 more minutes. Add few drops of heavy cream until it reaches the consistency you desire. With a spatula fold in the sprinkles. Gently unroll the cake and spread the buttercream evenly all over it. Roll it again and place in the fridge for a couple of hours. Let the chocolate settle for few minutes and slice the cake. If you can't find the batter bits, you can use Christmas edible confetti instead. They will not bleed while baking the cake. 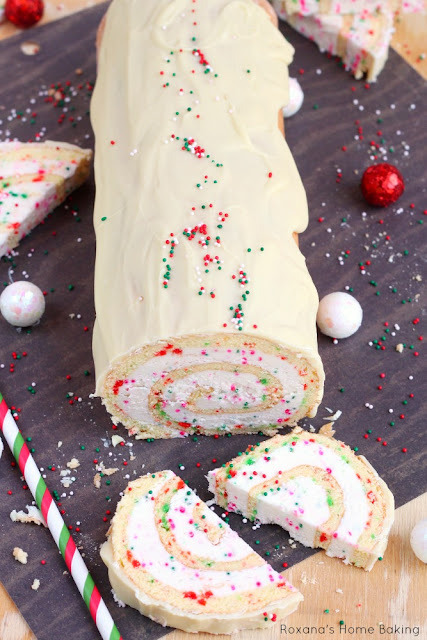 0 Response to "CHRISTMAS VANILLA ROLL CAKE RECIPE"